Shortly after the unveiling of Tesla’s Model 3 earlier this month, Elon Musk took to Twitter in a storm of information about the new car, mentioning that the target drag coefficient was 0.21. If that target makes it to production, it would make the Model 3 the most aerodynamic high-volume production car ever made. Here’s the plan to do it. Of course Tesla pulled this same stunt off with both the Model S and Model X, but it’s more important for the Model 3. The efficiency of having Tesla’s smallest battery pack maintain the promised 200 mile or more range means the Model 3 maintains its practicality and affordability—and that all comes down to aerodynamics. A report by Electrek reveals that Tesla is using digital simulation tools for designing the Model 3 supplied by Exa Corporation, which allow the automaker to virtually shape the aerodynamics of the car and assist in the quest to achieve the target of a 0.21 drag coefficient. Tesla uses Exa’s PowerFLOW digital simulation software in-house to design its cars. We don’t see the process, but by analyzing the cars that Musk unveiled at the end of March, we can see where Tesla has innovated. The differing turbine-blade styling not only comes across as fresh and appealing, but it also directs the flow of the air under the body of the car to reduce drag. That’s smart. Tesla could have used an active aero solution that closed the vanes on the wheels at speed, but they chose not to. In fact, it appears there are no active aero devices on the Model 3, which reduces the cost of making it. Here only the shape remains. 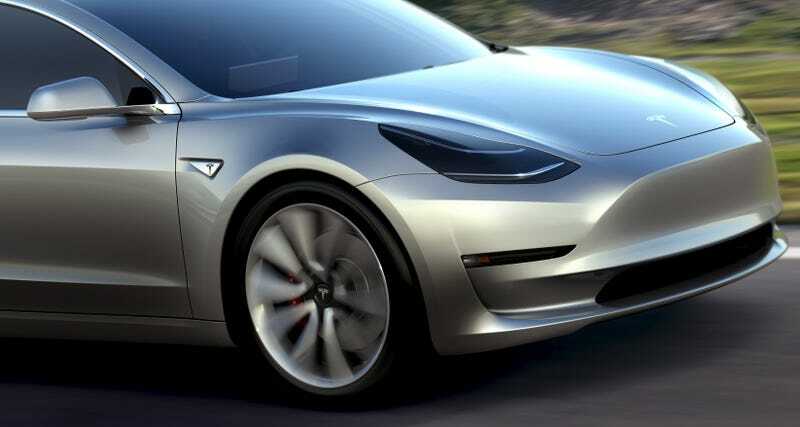 A more wedged front end, such as used by rear-engined Porsches, might well be more desirable aerodynamically, but Tesla could be using the grille shape with its rounded edges to control the air flow over the top or round the sides of the car. The Model 3 also employs air curtains in the lower fender that exit ahead of the front tires to provide a drag-reducing air stream over the wheels, while helping the flow transition smoothly around the sides of the vehicle. The underbody is likely to be flat and smooth, ending with a rear diffuser to control the air coming from under the car. Despite the polarizing look of the Model 3, it’s fairly obvious it is designed for optimal efficiency. Though, complaints about the awkward nose may have triggered a re-think of the design by the time the car makes it to production sometime in late 2017. The most interesting takeaway from Alajbegovic’s speculation is the lack of active aerodynamics on the Model 3, which goes a long way in keeping the costs of the “affordable” Tesla EV down, but doesn’t hinder the efficiency by any apparent margin. It may also help in preventing quality issues, which Tesla has had a big problem with lately. It brings into question just how much companies like Ford are giving up on engineering efficiency into cars in favor of saving some designer freedom, instead opting for aerodynamic “shortcuts” like active aero devices in the grille and wheels popularized by the new F-150. If Tesla manages to bring the ridiculously low 0.21 drag coefficient into production, not only would it be the record for the most aerodynamic mass-produced car ever made, but it would also go a long way in maintaining everyday practicality of the EV while getting away with lighter, cheaper, and smaller battery packs. So how would you have it? Do you take the Model 3 with a bit of an ugly face in return for a few dozen more miles of range, or do you want yourself a small, electric four-door Porsche lookalike? Perhaps if we hold out for production, Tesla just might pull off both.